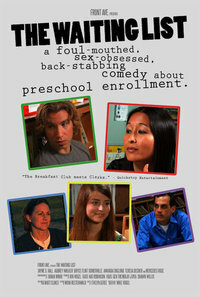 Watch Portland filmmaker Mike Vogel’s The Waiting List Tuesday, April 20th for free, on Ustream! The Waiting List is Mike Vogel’s first movie and it was made to be seen by parents (and fans of vulgar comedy). In order to ensure that everyone in the entire world (with an internet connection) can watch the movie, we will be streaming it live on Ustream. For free! You don’t even need to leave your house. It’s more than just watching a movie online… you can participate in live chat with director Mike Vogel and cast members Teresa Decher, Amanda Englund, Mercedes Rose and Audrey Walker! Ask questions! Make snarky comments! Anonymously! There will be exclusive outtakes shown after the movie. If you’ve never watched a live Ustream and chatted with others watching the same show, it will be a memorable evening (spent at home in your pajamas). And if you have, you know what a blast this is going to be. And read our interview with Mike Vogel – you’ll learn about his favorite breakfast cereals, waterboarding his daughter, and nano-budget filmmaking in Portland!